Bryce Harper continued his torrid MVP-caliber season with his power on full display. 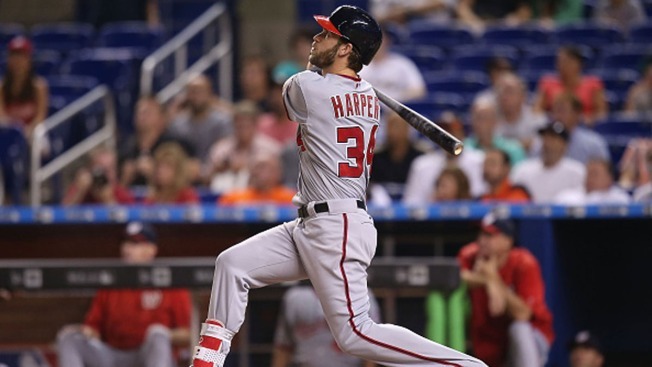 He homered twice into the upper deck and drove in four for the Washington Nationals in a 7-2 win over the Miami Marlins on Wednesday night. The 22-year old superstar and former No. 1 overall draft pick went 3 for 4 to raise his batting average to .335. He has 29 home runs and 68 RBIs, which are already career-highs. "He did a lot of damage today,'' Nationals manager Matt Williams said. Michael Taylor also homered and drove in two for Washington. Doug Fister (4-6) picked up the win. allowing two runs and four hits in six innings. Harper's first homer drove in three and came off of Tom Koehler (8-7) in the fifth inning breaking a 2-all tie. "Hank Aaron said it, it's not how far, it's how many,'' Williams said. Harper then led off the eighth by sending a first-pitch fastball from Sam Dyson deep to right field. It was his third multi-home run game of the season, first since hitting two against Atlanta on May 8. Harper said he was happy about his two-homer night. "But all in all, I'm just very happy to have our team back and this lineup back,'' he said. Koehler pitched six innings and allowed five runs. Ichiro Suzuki opened the scoring with an RBI double in the second for the Marlins. The Nationals took a 2-1 lead in the fourth when Ian Desmond hit an RBI triple and scored on a sacrifice fly by Taylor. Adeiny Hechavarria tied the game at 2 with an RBI single. Suzuki's RBI double in the second was his 2,900th major league hit. He also singled in the fourth and is 99 shy from joining just 29 other players in the 3,000-hit club. Marlins: RHP Henderson Alvarez underwent season-ending shoulder surgery on Tuesday to repair a torn labrum. Marlins manager Dan Jennings said all indications are that the surgery was a success. Nationals: RHP Max Scherzer (10-8, 2.33 ERA) will take the mound in Thursday's series finale scheduled to start at 12:10 p.m. Scherzer is looking to bounce back after allowing five runs on seven hits including a season-high three home runs in a 7-5 loss at Pittsburgh on July 24. Marlins: RHP Dan Haren (7-6, 3.51) could be making his final start with the Marlins as he has been the subject of trade rumors before the July 31 non-waiver trade deadline. Haren is 1-1 with a 3.94 ERA in five starts in July.